the big daddy weave: The Georgia Drought - Will Atlanta Go Dry? Last week, Georgia Governor Sonny Perdue held an hour-long prayer vigil at the state Capitol, asking God's help in relieving extreme drought conditions that threaten Atlanta's drinking-water. The Georgia Baptist Convention declared November 4th a day of prayer for rain. 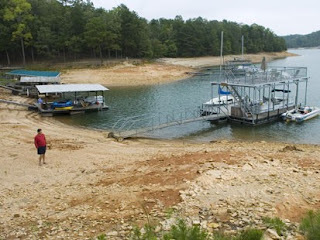 Back in September the Georgia environmental protection director declared Level Four drought restrictions in 61 northern countries, including metro-Atlanta. According to many sources, Atlanta (where rainfall totals are more than 16 inches below normal) is likely to run out of water in less than 90 days. If the southeastern drought is already off the charts in Georgia, then, whether it's 80 days or 800 days, isn't there a possibility that Atlanta may one day in the not-so-distant future be without water? And what then? Okay, they're trucking water into waterless Orme, Tennessee, but the town's mayor, Tony Reames, put the matter well, worrying about Atlanta. "We can survive. We're 145 people but you've got 4.5 million there. What are they going to do?" Let's face it, with water, you're down to the basics. And if, as some say, we've passed the point not of "peak oil," but of "peak water" (and cheap water) on significant parts of the planet… well, what then? This weekend I made the trek from Waco to Athens by way of DFW to ATL. My Dawgs took care of business and defeated the Kentucky Wildcats. But while on campus, I noticed signs EVERYWHERE asking students to conserve water. Shops, restaurants, bars, and almost every public facility had green CONSERVE WATER signs posted. And above every toilet at Sanford Stadium signs were posted that read DO NOT FLUSH. A tad disgusting by the second half indeed! Large parts of Georgia and especially Atlanta are clearly in bad bad shape. We should pray for Georgia leaders like Sonny Perdue to quickly find a solution to this frightening problem.